I am an established, professional drum teacher offering private drum lessons on a one-to-one basis. Beginner or advanced, my teaching approach will help you learn, improve and develop as a drummer and musician. Learning the drums should be fun and rewarding, with the ultimate aim been to empower you to play with confidence and with your own sound and style, to this end all lessons are tailored for the individual student. 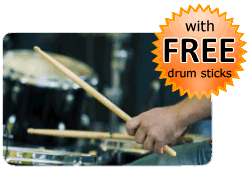 I am based in Milton Keynes and offer top quality facilities to assist your progress in learning to play the drums. I hold an enhanced CRB certificate which clears me for work in schools and with children and have experience of working with students with special needs. I’ve been taking drumming lessons for five months with Joe Rodriguez. I thought it would be difficult to learn to play drums, but with Joe as my teacher it is really quite easy. I would recommend him 100%. Thanks Joe! Joe has been teaching my Son aged 6 to play the drums over the last 10 months, and it's been a joy. Not only is Joe patient and friendly, he really knows his stuff. He has a great way of teaching that engages and encourages. I'd have absolutely no hesitation is recommending Joe. At the age of 52 I have finally plucked up the courage to learn the drums. Been putting it off for at least 30 years because I hate failure. Been going to Joe for 7 months now and a better tutor would be hard to find. This person respects the pace you learn at and will not push, if you don't feel comfortable he drops it back down to a speed you can play at. His patience is superb. The whole experience of playing the drums is enjoyable because of Joe's professionalism. This is the person you need if you want to be a drummer and not just a showman on the drums. Don’t You Just Hate Your Drum Teacher Sometimes? Now although I’m no spring chicken, gave up drumming 20 years ago and obviously knew I had a few ‘habits’ that needed changing, I really didn’t think I was that bad for an oldie! However, since starting lessons with Joe he has: 1) Changed my bass pedal technique. 2) Changed my traditional grip to matched grip. 3) Changed my left hand finger stick control. I’ve now had a total of 17 lessons with Joe since my first post on 9th April and kept a practise diary every day so I can look back and see what I’ve achieved and how I’ve improved. This helps back-up the pros and cons of Joe’s comments/guidance and also allows me to see after each and every diary entry, the hours/minutes I’ve practised and gives a total for the end of the week that shows me the average time practised each day. Each and every change Joe has suggested, NOT forced upon me, has seen a dramatic improvement on control, speed, power, ambidexterity and, most importantly, enjoyment. Like I said at the start, Don’t You Just Hate Your Drum Teacher Sometimes? In this instance, NO is the resounding answer as every change Joe has suggested has been a huge benefit! To merely thank Joe for his patience, understanding, enthusiasm, professionalism, encouragement and fun lessons would be an understatement. However, I know that Joe gets as much excitement, pleasure and pride from all of his students that take what he teaches and puts in to practise. Just take a moment to read the glowing praises in his Guest Blog. REMEMBER, Practice makes Permanent – So if you practise incorrectly, you’ll have a permanent problem that is much harder to put right! To our drumming success. Just want to say thank you for being such a great teacher. Each lesson is a joy and always goes at my pace with patience and enthusiasm. Highly recommend this teacher for anyone, whatever stage you are at ! My son Harvey is 9 and has been having lessons with Joe for a couple of months, I think Joe has a really good way of teaching and is very patient and understaning, Harvey is loving his lessons. Met with Joe for the first time yesterday on my birthday no less and WOW, hugely impressed. I gave up drumming appx 20 yrs ago and finally decided I needed to return to my 'roots'. Purchased an electronic kit (Yamaha DTXtreme IIs) so I don't upset the neighbours and then decided to search for a teacher. I was so impressed with what others had to say and, as Joe only lives 5 mins away, thought this must be the teacher for me! Turned out I was right - laid back, easy to talk to and understand and so looking forward to develop my drumming to a level I know Joe can help me with. Thanks Joe and see you next week. Only one and a half years of lessons with Joe has made a huge difference to my music career! Alongside with my busy work on Rockschool Grade 4, I developed from a drum dummy into a band drummer in a local church! All thanks to Joe's patience and amazing teaching skills. I do not hesitate to recommend this nice guy to the ones who want to learn cool drums! Hi Joe, I would like to take this opportunity to say a very BIG thankyou for teaching our daughter the drums over the last year. She has progressed brilliantly and its a wonder how you have managed to stay patient with her through the lessons. We would have no hesitation in recommending yourself for lessons. Cheers Chris. Joe is such a great teacher, he is such a lovely, funny guy who is so easy to get on with,. I've never had so much fun learning, not only do I learn techniques that I can apply to all styles, I have also learnt songs and I have started Grade 3, I would defiantly recommend anyone to Joe, as he is patient and positive and just a great teacher! Learning to play the drums is something I've always wanted to do and having started lessons with Joe a couple of months ago, the experience is more fun, educational and rewarding than I could have imagined. Joe is an exceptional tutor, always patient, encouraging and professional and a genuinely nice guy. I'd have no hesitation in recommending Joe to anyone wanting to learn to play drums. Basically to put it simply Joe is the best teacher you will ever come across, he is the nicest guy with a sense of humor & sessions are relaxed and he pushes you to get the best of your ability. I didnt know if i wanted to play drums but after a few sessions with Joe I knew its what I wanted to do! Thanks for all you help Joe! Joe you have the patience of a saint! I have the coordination of a camel on acid and the concentration of flea, despite this you have managed to teach me how to play and read music in such a short space of time. Friday evening has never been so much fun - Thanks for being such an awesome teacher! Hi Joe, Just a quick msg to say how much i am enjoying my lessons nearly 2 months now and I can't believe the things I've learnt and I thought 30 was to old to learn an instrument fingers crossed grade 1 soon!!. Anybody looking to learn the drums you can't go wrong with joe no matter what age, Very patient and a genuine nice guy. * PAY NOTHING NOW * Payments for drum lessons are made directly to Joe Rodriguez. You do not pay in advance to book a drum lesson with Joe Rodriguez via this website. The Booking Request Form on this page enables Joe Rodriguez to get in contact with you to confirm a day and time for the drum lesson.